St. John Ambulance Northumberland’s Therapy Dog Unit has received a Community Grant of $5,300 from 100 Women with Heart Northumberland. The volunteers of the St. John Ambulance Northumberland Therapy Dog Unit, both human and canine, bring comfort and companionship to those in the community who can use it most. Currently, 45 teams composed of a gentle, friendly dog and its owner visit seniors, hospital and hospice patients, those with special needs, and children at nearly 40 programs and facilities across Northumberland County. 100 Women with Heart Northumberland, a group of community minded women who nominate local charities to receive pooled donations, awarded their latest grant to the Northumberland Therapy Dogs in June. 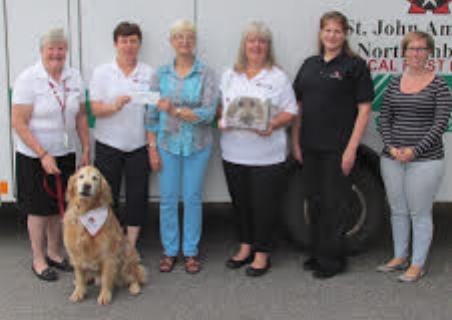 The generous grant by 100 Women with Heart Northumberland will enable the St. John Ambulance Northumberland Therapy Dog Unit to continue to grow and be there to care for area residents in need of canine cheer.